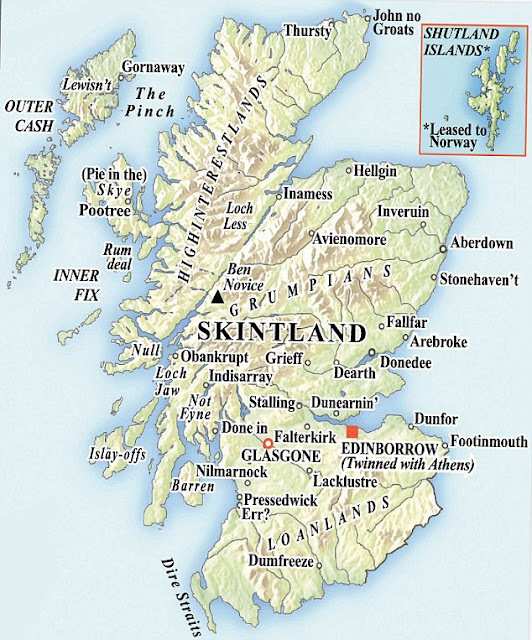 Musings of a Durotrigan: Scottish Independence: Desirable? Gordon Brown has been so silent since the last General Election, at least in the domestic context, that you could almost be forgiven for forgetting that he had ever existed. Just what has he been up to these past two years? Still, given the damage that he managed to inflict upon the country when he was in a position to influence policy and public affairs, it is just as well that he has kept his head down since 2010. Yesterday however, the former Prime Minister broke his silence to voice his opinions on the subject of Scottish independence, which in a rare moment of concurrence proved in a number of respects not to be so far removed from my own. In short, Brown is against the dissolution of the Union. If you break up the fiscal union, the sharing and pooling of resources across the UK, then it’s clear that you will either have to cut public expenditure massively beyond what is being done at the moment or you will have to tax Scottish people more. Quite clearly, the removal of the subsidy channelled through the Barnett Formula would subtract a significant amount of money from Scotland’s budget, although this claim is disputed by Alex Salmond’s SNP owing to the party’s stated intent of seizing the bulk of North Sea oil revenue for Scotland alone. However, Salmond’s insistence that Scotland would wish to retain Stirling as its currency indicates that the SNP truly does wish to have its cake and eat it. The current devolved constitutional settlement created by the last Labour Government is neither just nor sustainable; it is in need of a considerable overhaul, but stopping short of the dissolution of the Union. Naturally, should the Scots, or the Welsh or Ulster come to that, wish to secede from the UK then it should be their sovereign right to do so. For the English however, they are in the unfortunate situation of having no say in the matter, for unlike Scotland, Wales or Ulster, they do not possess a parliament or assembly of their own, having to make do with Westminster which of course affords representation to all of the other constituent nations of the Union. The English, should they wish to do so, could neither therefore secede from the UK nor from the EU for they possess no representative body. One party has as its primary concern the creation of a specifically English parliament – the English Democrats – and in the past year UKIP too has toyed with this idea. However, such an institution is not necessary to disentangle ourselves from the devolutionary mess in which we find ourselves. What we should aim for instead, is for Westminster to be both the English and UK Parliament, but for Scottish, Welsh and Ulster MPs to be debarred from voting on matters of policy that are devolved to their own institutions such as education and health, with English MPs alone voting upon, and devising policies for England, in these spheres. MPs from the devolved nations would still retain voting rights in matters relating to foreign policy and other aspects of non-devolved policy. Such a solution would be equitable, truly democratic and would also preserve the Union. However, as Scotland, Wales and Ulster possess the right to secede, this right ought also to be granted to England and the English Parliament at Westminster. It would also ensure – for better or for worse – that the UK could maintain its status as a permanent member of the UN Security Council, for membership would almost certainly not be inherited by a rump Union under England’s leadership in the event of Scotland’s secession. Although the Russian Federation inherited the USSR’s permanent seat following the dissolution of the latter state at the end of 1991, this pattern would not be replicated for a truncated UK. Scottish independence could lead to a host of problems, not least, should a party ever come to power in England with the serious intent of tackling the question of mass immigration, by introducing the potential need for border controls between the two states. Given the SNP’s desire to increase Scotland’s population through mass immigration – a curiously anti-national position for any self-avowed nationalist party to take – such a system of border controls would regrettably have to be imposed. The Union between England and Scotland came into formal existence in 1707, but with the exception of the Interregnum, the two countries have been united under the same crown since 1603. Both have gained much from the Union, and would also have much to lose were it to end. 1. Quite correctly you point out the massive loss of income to 'Skintland' if the Scots vote for independence. Something that no one has attempted to quantify is the indirect financial assistance to Scotland from budgets that are not devolved to Holyrood. For example many Scots are involved in Army, Navy and RAF bases north of the border. People in the SW are being made redundant by the closure of the Devonport Naval base - the frigates are being deployed to Portsmouth and all the submarines are going to Faslane. Many government agencies have offices in Scotland - Student Loans being one of them. Scottish shipyards get Royal Navy orders. For example the same, Gordon Brown, ordered two aircraft carriers to buy Scottish votes. What if future Royal Navy orders only went to shipyards in Barrow, Devonport etc ? 2. Gordon, Miliband etc all want Scotland to stay in the Union. Why ? Simples ! Without the core vote of Scottish Labour MP's the Labour Party would have great difficulty in ever winning an election in the rest of the UK. How would the Labour Party, even if it managed to win an election, fill all it's Cabinet positions ? We might have English Labour MP's in Cabinet taking decisions on English issues !! Shock ! Horror ! 3. A cross party campaign to encourage Scottish voters to vote against Independence was launched a few months ago. The front man, the spokesman, was the very well respected, former Chancellor Alistair Darling (you thought I was going to write 'Gordon .. . . ', didn't you ?) I cannot see how this campaign is going to be able to go forward if Brown gets involved in pro Union campaigning. Brown is unable to work on a cross party basis. Brown and Darling cannot work together. So Brown's intervention could damage a pro Union campaign and help something which Brown sincerely detests happen ! BTW Duro, having read your thoughts on Scottish devolution what opinions do you have on the situation in Wales ? Hello Ivan, your observations are very apposite. Plymouth has suffered dreadfully in recent decades with the gradual running down of the Devonport facility, and many of the new jobs that have come to the city tend to be in the low-wage service sector, as exemplified by the proliferation of call centres. These can hardly be relied upon to plug the economic gap created by the loss of Devonport’s support of frigates and the submarine fleet. Clearly, given Scotland’s current political mood and trajectory, we should be campaigning for Plymouth’s retention as the primary base for our submarine fleet. A similar principle ought to be employed with respect to future naval orders, with Barrow and other English dockyards being given preference. Labour’s objection to outright Scottish independence does appear to rest, as you note, on the correct calculation that it could ensure that the party would never again be in a position to form the Government in a truncated Union or England. Perhaps now that Gordon Brown has joined the campaign against independence, Alistair Darling’s eyebrows will shortly be matching the colour of his hair: grey. As for the situation in Wales, I do have some thoughts, but as to what they are, you will have to wait for another day and another article. Although at first glance you'd think Scottish independence would mean the end of Labour as a party of government.I've also read however that only once in the past 50(? )years did the number of Scottish Labour MPs have made a difference to who won the election. However if Wales (and this is in the long term not beyond the bounds of possibility when it is realised how many welsh people now look on their parliament as a good thing as opposed to how narrowly it was originally granted - take the English immigrants out of the equation and the picture would be even more promising for independence)also eventually left the loss of all the Welsh Labour MPs when added to the Scottish losses would definitely tip the balance towards the end of Labour in England. And then of course there's the first signs (Bradford, Tower Hamlets coincidentally the first areas where they have reached critical mass to win elections)of non-white immigrants waving goodbye to Labour and voting for their own candidates.And then the massive apathy in once rock solid white Labour areas such as Barnsley where they might still get in but on a 25% turn out in some cases. As things stand I'd imagine the North East is the only remaining white area which is still prepared to blithely turn out en masse to vote for Labour and even there in 2010 there were massive swings away from that party. I always thought it was a shame Alex Salmond and Scotland would not go the whole hog and detach from England (Angerland, or is it Angstriddenland, if you want to play childish renaming) and adopt a policy of neutrality ... the "Switzerland of the North" equation. I mean, who on earth does Scotland need defending from, and why on earth must is young men continue being used in overseas wars for the global elite? And, come on, this talk of border controls is just silly stuff fit for confusing tabloid readers. Yes, I tend to think Labour politicians' defence of the Union, and their manipulation of Scottish minds and media, has always been based on their own turgid political careerism rather than any sense of greater good. But forget Scotland, I think Scottish Independence would be a great favour for England ridding them of the Labour Party, and we should let it go free. What on earth is "geopolitical clout" and what value does it have in this day and age? I rather think both nations ought to be stop clouting anyone, and given the unlikelihood of a war against Iceland or Norway, what on earth are we still playing wargames for? Thank goodness my grandparents left this bleak land for Canada a century ago. The independence movement seems to be if very little interest here, despite a huge number of people of Scottish descent.